Black Mountain located north of Craig in Routt National Forest. The area offers spectacular Rocky Mountain scenery from overlooks and vistas, unlimited picnicking sites, and a potential to view some of the more than 300 species of wildlife that inhabit the region. The camping areas serve as ideal base camps for day hikes, hunting and fishing trips, animal observation, and inspiring panoramas in an uncrowded atmosphere. Gravel forest service roads will take you through Lost Park, Slater Park and California Park. 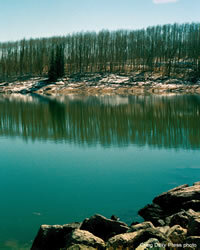 Visitors can view this spectacular area by car or by hiking on one of several, marked trails in the area. 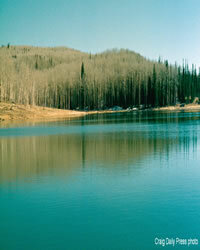 This 17-acre reservoir is 21 miles north of Craig, CO on U.S. Highway 13. Drive 11.8 miles to the Freeman Reservoir sign (CR 11). Turn right and continue on the gravel road for 9.9 miles to the campground. This campground has 17 developed campsites with tables and fireplace grates, a water system (seasonal), vault toilets, dumpsters, and pull-through spaces (under 22 feet). This campground is open approximately mid-June thru Oct. 31. The overnight camping fee is $12 and there is a 14-day stay limit. This area accesses several hiking, horseback and biking trails. No motorized trails are accessible from this area. The reservoir offers fishing but no motor-propelled craft, including electric motors are allowed on the lake. There is an accessible fishing bump-out at the termination of the hardened trail, which follows along the south shore of the lake. The area is popular among hunters during the early rifle seasons, but it also provides an abundance of primitive camping opportunities and hiking trails. 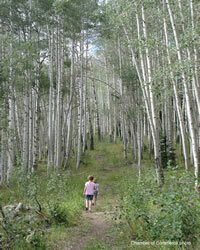 Black Mountain Trail: 3.5 miles to the summit of Black Mountain (10,800'). An easy climb offering sensational views of the Yampa Valley and into Utah and Wyoming. Slater Falls: A half-mile hike to a beautiful 30' waterfall on Slater Creek. Bears Ears Peak: Drive or hike to the top of this prominent Moffat County feature, aptly named for its resemblance to bear's ears. Breathtaking panorama of the Yampa Valley. A full trail map is available in the brochure download above. Six primitive camping sites with amazing views of the Yampa Valley and access to several hiking trails. Spectacular views, scenic park and access to hiking, horseback trails, motorbike trails and fishing. Beautiful 8,000 acre park. Closed to motor vehicle use from May 15-July 1 each year to protect Colorado's largest population of Greater Sandill Cranes. This park is known for big-game hunting and has miles of small mountain streams that are stocked for trout fishing. Offers areas for dispersed camping, hiking, fishing and spectacular park and mountain scenery.